Durability, elegance, and reliability unite with these shades & blinds! The Exterior Zipper Track Shade Systems from Mariak and Vertilux Shades & Blinds are some of the most innovative window treatment trends for 2015. Rated to resist wind speeds up to 65MPH, Vertilux Zipper Track shades are perfect for both commercial and residential in areas close to the waterfront. Mariak Exterior Shade Track systems are rated for 35MPH winds and are ideal for commercial and residential use in inland areas. In this post, we are going to teach you about the Exterior Zipper Track system from Vertilux as well as the Mariak Exterior Shade Track system and why they are top of the line shade systems. We love how the shades invite natural light while keeping elements, breezes, and sun glares at bay. Exquisitely engineered, the patented design of the Zipper Track Shade System from Vertilux features a strong, reinforced zipper down each side to secure the blind to the track. These shades are rated for 65 mph winds which makes them perfect window shades for San Diego homes when bad weather rolls in or the Santa Ana wind blows. The bottom rail holds the shade tension while a felt buffer at the base compresses against the ground to create a seal against breezes, dust, and bugs. Ultra-sonically welded, the innovative design of the Exterior Shade Track system by Mariak, features double welded corners and durable zippers down each side of the shade for strong tension. Rated to resist wind speeds more than 35MPH, these shades are the best exterior window coverings for residents in inland areas. The Mariak model also features a bush guard at the bottom to repel insects, dirt, and debris that could blow into your home. 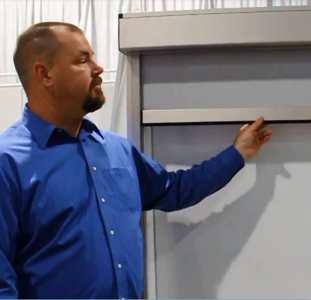 The Vertilux Zipper Track Shading System and the Mariak Exterior Shade Track System are weatherproofed motorized window treatments that function both indoors and outdoors. 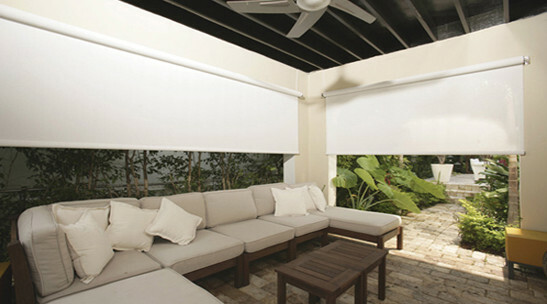 The motorized cassette at the top of the shade neatly rolls the shades up or down, and can easily be controlled both manually or by remote control. The fabric, while tough and hardy, is lightly opaque to offer privacy. The weave of the shade is crafted to allow in the sunlight in while reducing harsh glare. The fabric is available in a variety of textures, colors, and widths. It can easily be customized to fit your space size and style preferences. Vertilux and Mariak Exterior Zipper Track Systems Have Many Uses! These unrivaled shading systems make great window treatment options for both residential and commercial spaces. Restaurants would benefit from a shaded, enclosed porch created with the shades, providing an extended dining area protected from the elements. The Zipper Track shades are also perfect for the home. Enclose the backyard porch for indoor-outdoor use no matter the weather. Utilizing the shade system as a garage cover for both commercial and residential garages transforms this space into a playroom or indoor-outdoor workspace. The screen allows for outside viewing and natural light while keeping elements, breezes, and sun glares at bay. Find the perfect shades or blinds by speaking with one of our knowledgeable designers. Call us at 858.452.6100 or contact us online to schedule an appointment and choose the right product for your home or commercial building.